UBU Council is different from the module-based class reps known as "Student Representatives" — although it is very interested in what those reps can tell it! 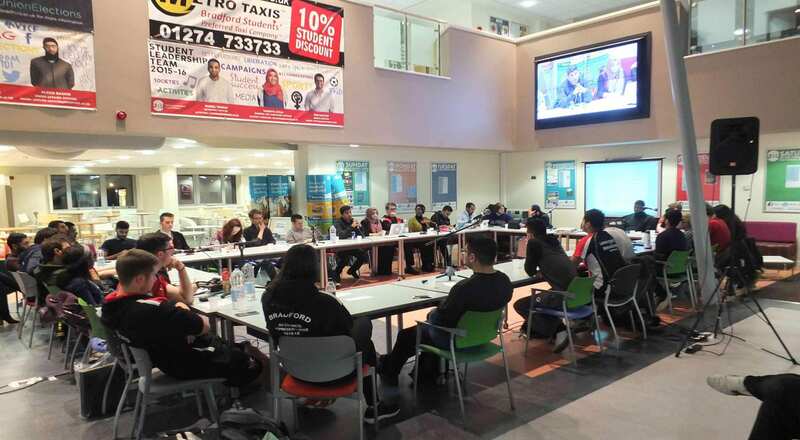 UBU Council in fact takes a strategic view and can discuss any matter affecting students at Bradford University. It is how we ensure we remain "student-led" and keep the voice of our students at the heart of our representation, support, and campaigning work within the University. It also oversees the work of the elected officers and – together with General Meetings – holds them to account. All decisions are governed by its By-Laws (see Governance). Any member of UBU (which includes every current student who has not actively opted out) can attend a Council meeting and ask the Chair for permission to speak. Only the elected members can vote. This is the key difference from General Meetings (including the Annual General Meeting) at which everyone can vote. UBU Council meets a minimum of 3 times per semester. It gives the members the chance to interact, learn and develop in their roles, and gives everyone the opportunity to know what each officer is doing and to hold them accountable. Any student who is a member of UBU can put an idea to UBU Council through a "motion". We are a student-led organisation, and this is the strongest way to put your ideas to the democratic test. Please note, we are a Charity bound by many laws! To ensure that motions are actually achievable and fit within our existing policies, the Council Advisory Committee checks them before sending them on to Council. If they have concerns about the legality or achievability of a motion they will be delighted to work with you to fine-tune it and make it a realistic proposition. This can be a hugely productive part of the process. We will work with you to gather evidence in support of your point, build a team of volunteers (because someone is going to have to carry out the policy! ), and arrive at a series of resolutions that UBU can effectively work towards and achieve. Then your motion goes to the meeting to be debated and democratically voted on, after which, if approved, it becomes our policy for five years. You can discuss a motion you have in mind by contacting the Council Advisory Committee. There is a deadline for submission to meetings of a full week beforehand, but we urge you to get in touch well before that so we can help you as described above. Motions must have a proposer and seconder, and fifteen "assenters" — students who sign up that they agree to its being discussed, but need not neccessarily agree with the content). All must be current UBU students and provide their UB number. What does a UBU Council member do? UBU Council members are the people that collectively decide the policy of UBU. The primary role is representation — of you, the students. Each councillor may also join committees, which work closely on campaigning and elections, amongst other things. They debate and set our policies and review the activity of the Executive Officers. Monday 29th October, 6:00 p.m. D2. Tuesday 13th November, 6:00 p.m. D2. Wednesday 5th December, 6:00 p.m. Norcroft. Thursday 24th January, 6:00 p.m. D2. Monday 11th February, 6:00 p.m. D2. Tuesday 5th March, 6:00 p.m. D2. Wednesday 3rd April, 6:00 p.m. D2. UBU members are welcome to consult the minutes of previous Council meetings. Please email ubu-counciladvisory@bradford.ac.uk to request these. We hope to make them all available directly online in the future.